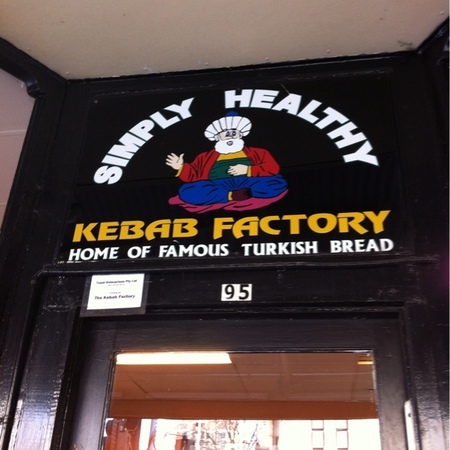 The Kebab Factory on Lygon Street is awesome. It's a casual restaurant with a Middle Eastern/Turkish feel to it. It was great to find something different in the area – not just another pizza/pasta restaurant or general sandwich bar. I wish I'd discovered this place earlier. I ordered and paid at the front counter and within a few minutes someone brought my meal to my table. I can see how getting a kebab would have made more sense, but I got the Vegetarian Platter. This consisted of bulgar rice, beans and two kinds of dip (pink and yellow) for $9.50 - it was tasty and very filling. Yeah, I know pink and yellow aren't flavours. Honestly, this isn't a fancy looking place – inside it kind of feels like just your average Uni student lunch spot – but it's got simple, rustic, wholesome, healthy food that tastes great. Why? Awesome hot, tasty filling meals for cheap.